I have full week of exciting events planned for Oshkosh 2016 and want to share with you the details which are listed on the links below. I am most excited about premiering my new book at Oshkosh, Flying Off The Grid – Bold Adventures and Lessons Shared by a Back-Country Pilot, and will be having two book signings. This book exists in part because so many fans have encouraged me over the years to write my stories, so I’m incredibly excited to share this news with you. I am giving four lectures, hosting special guests for my “Under The Wing” seminar series held right under the wing of my airplane which will be located near the main walkway at Boeing Plaza. Having partnered with Honda Generators, they provided a space for my plane next to their text at (Booth 381 – in the Boeing Plaza area) across from the North Cascades Vintage Aircraft Museum. If you would like to sign up to attend any of the events, you can do so through Facebook using the links provided on each event below. Signing up is not required, but I am bringing special gifts for the attendees and having a count helps me make sure I bring enough for all of you. 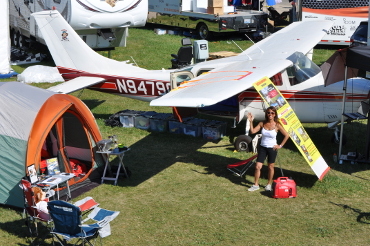 If you attend Oshkosh, please stop by my plane and say hello!